Find out how I photographed the most well planned destination Indian Wedding in Jaipur for a Punjabi Indian Groom and an American Mexican Bride. Being a wedding photographer in Bay Area, California, I have been discovering cross cultural weddings from past 5 years. I see more and more weddings with two and sometime 3 different cultural traditions and rituals.That puts me in a place where I can proudly say I have had the privilege to photograph Mexican, British, Chinese, Hawaiian, Hindu, Sikh, Marathi, Afghani and South Indian weddings in my 5 years stint as a local wedding photographer near you in San Jose, CA. Indeed very exciting and I am so chuffed to be not labeled as doing just one type of weddings. Coming back to this ultimate destination wedding photography in Jaipur was no less than a dream come true. Planning a wedding is no joke and it becomes even more challenging when your heart is set on a Royal Rajput style wedding fused with Punjabi traditions and Mexican American bride. Yes I know it sounds all complicated but as your future wedding photographer, I am here to help, so stay awhile. Two very distinct cultures, two very different families and two beautiful souls = A great Destination Wedding in Jaipur, India. 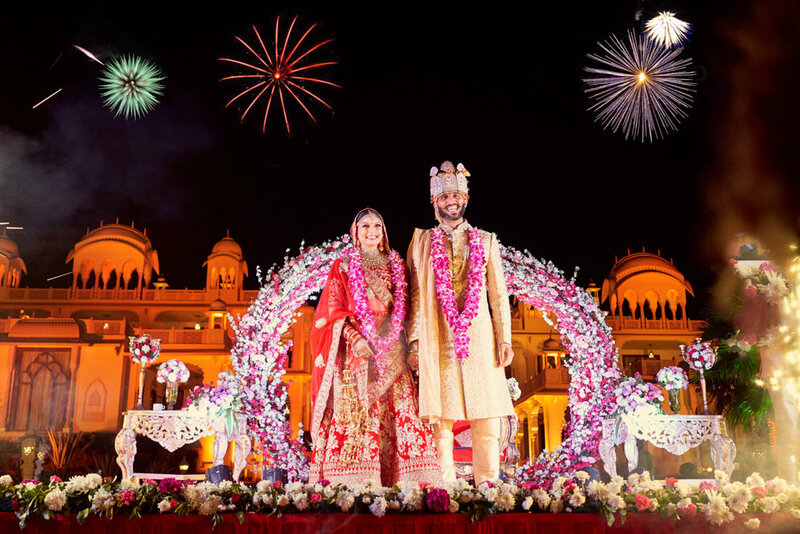 You can scroll down anytime to take sneak peek at A Few Good Clicks of Roxie & Aakash’s multicultural Indian wedding at Rajasthali Resort & Spa in Jaipur. You can also enjoy their civil ceremony wedding pictures shot at San Francisco’s City Hall and see a true amalgamation of two very distinct cultures. However, I want to highlight some micro areas that really made this wedding a massive hit. From all practical point of view, it not only make sense to combine both groom and bride side events but also make it cost effective. Imagine having to deal with two separate vendors for every event like Haldi, chuda, mehndi and sangeet. Moreover this is probably the only time where both families and friends will get to know each other. Admittedly there are still weddings where you have separate events in your respective family. I personally highly recommend combine rituals and let both sides have fun. Oh yeah I can’t stress this enough and especially when you have mixed race couple following one tradition( in this case hindu punjabi rituals). Remember you want to have a stress free wedding and by appointing one coordinator who knows what’s going on is a huge perk for the host and the vendors alike. Choosing the right wedding spot is as crucial as choosing the wedding dress. It can’t be all over the place so like Roxy and Aakash did, they planned all the accomodation for their 200 guests and ceremonies at the same resort. While it’s very common in India that bride usually gets ready at a make-up studio which of course saves money but adds the travel time and enormous stress of getting ready and returning. Strike a deal, convince your hair and makeup artist to travel to your location. Add more family members to get ready by the same team of make-up artists to ensure they don’t miss out financially and everyone feels like a star. Speaking from photography perspective, It gives your photographer an amazing opportunity to cover all the details and getting ready pictures. They form a perfect story ...your story! If you are planning on having one, then you could essentially have little to-go boxes ready for your guests on their departure. Speak to your planner or you can also reduce the number of desserts in the buffet and serve cake instead. Factor in time to get formal pictures done for not just the bride & groom but also the close family. Make a list, add to the timeline and stick to it because your photographer doesn’t know who your favourite aunt or cousin is so prepare in advance. Like many hindu weddings, there are lots of games starting from gaana opening, til bhalle to searching the ring in milky water etc are played by bride & groom after the wedding is over. 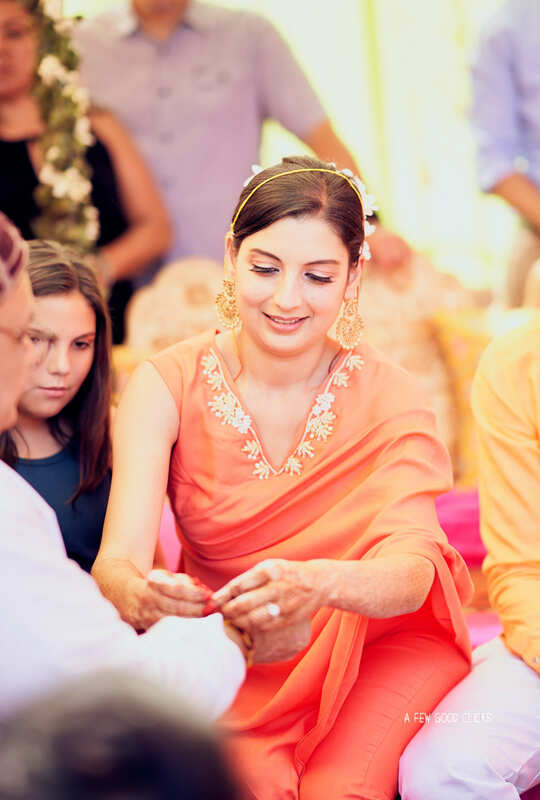 And because Indian weddings run long and most of these games happened at home. So here is my two cents worth, how about you plan it at the wedding location? These are bound to be most fun and candid picture op so consider it doing it soon after the 7 circle (fera) ceremony. With universality of love among mixed race couples, I am sure there are 100 more ways to make it a perfect wedding day celebration. I would love to hear from couples who are looking for wedding inspiration to plan their very special day. Groom dancing on the bhangra tunes. Mehndi ceremony set-up at Rajasthali resort & spa in Jaipur, India. Bride & Groom during pre-wedding ceremonies. And here the mehndi starts for our beautiful bride Roxie. Grandma blessing the bride & groom. Bridal party fun with dhol. Poolside set-up at the Rajasthali resort for the haldi and chuda ceremony. Fun with haldi | Bride and groom playing haldi with everyone in the party. That’s the haldi spirit - Roxie & Aakash hugging each other during haldi ceremony. Indian groom getting ready photos. Groom’s jewellery in Indian weddings. Royal Rajput Bride getting ready shot. Bride’s portraits soon after she got ready. Bride joining hands - Classic yet elegant pose! The extravagant wedding stage set-up at Rajasthali resort, Jaipur. I really liked the use of temple bells in mandap set-up for the fire ceremony. Rajasthali Resort during evening time wedding.